Once we have set up the AAC, it is time to start communicating with the AAC user. We are the communication partners - the ones who will guide them and support them to communication success. Our role as a communication partner is one of the most important “jobs” we will do. What we do counts; what we think is important; how we respond matters; every interaction is an opportunity to grow language and communication. accepting all forms of communication (multi-modal communication). •	Presume competence and believe in the AAC user’s ability and potential to become a successful communicator. •	Be flexible by being ready to adapt and change in response to the situation and the learner’s communication attempts. •	Be persistent and never give up on communication. •	Be consistent; using the AAC user’s communication system regularly and reliably. •	Engage and interact with AAC users; providing real and motivating reasons to communicate. •	Be patient by being ready to allow time for communication to happen. •	Provide a balanced AAC system including both core and fringe vocabulary, and the alphabet. •	Make AAC always available. Combine these traits with skills in modeling, prompting and responding to build your communication partner skills. AAC users need to see what it looks like to communicate with their AAC systems in real conversations. To do this, we need to talk to them using their AAC! Being a good communication partner means that we model on the user’s AAC system regularly and reliably. It might feel difficult at first, but the more we model, the easier and more natural it will become. 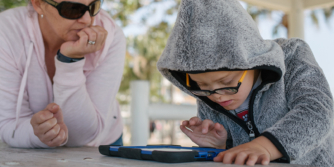 Regular and reliable modeling also improves the chances that the AAC user will learn to use their AAC system to communicate about what matters to them. Model across different contexts and environments. Model the key words in the sentence; we do not need to model every word we say. Try modeling one more word than the AAC user is currently using. Modeled sentences do not need to be grammatically correct. Model a wide range of communication functions, e.g. not just requesting, but also giving opinions, telling news, having conversations, etc. Use self-talk as we model, talk about what we are doing, what folders we are opening to find the word. Use a slow pace as we model. Have a low-tech paper-based system available to model on in situations where high-tech might not be appropriate (e.g. at the pool). •	Continue modeling even if the user is not watching you. •	Don’t stop modeling once the AAC user begins using their device. Just start modeling something different: new words, combinations of words, or new communication functions. •	One model is never enough - we may need to model the same words in the same situations often. •	The AAC user may not always respond or reply. Continue modeling. He or she still benefits from the language exposure! •	We don’t need to make the AAC user copy the model that we provided. If we are unsure what words to model, then some of the Core Word Planners and Core Word 5 Minute Fillers in the AssistiveWare Core Word Classroom may help us get started. As we interact with an AAC user, think about the language or sentences we use. Do we always ask question after question? And what type of questions do we ask? Yes/No questions? Questions we already know the answers to? Asking lots of questions puts an AAC user in a passive role. They learn to respond but not to initiate or change the topic of conversations they're participating in. They may even feel they are being tested. It also reduces their opportunities to see and practice using language for real communication. If we think about our own communication, our most rewarding conversations probably don't have right or wrong answers. Instead of always asking questions, we can make comments about what we are seeing, doing, and thinking. This will better prepare the AAC user to participate in natural interaction and language. Modeling while we describe and comment gives the AAC user more opportunities to see how real communication can look. Using AAC can take time! It can take a while for many AAC users to start moving their body to make their message. Probably one of the most important things we can do as a communication partner is allow more time by pausing and waiting. 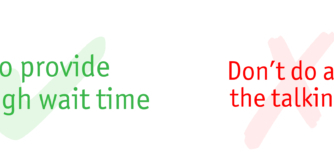 So, remember to allow time by waiting for AAC user to take a turn. When we do pause, pause expectantly. Look toward the AAC user with an open expression that encourages them to take up their turn if they can. It can be a great idea to count in our head to at least 5 seconds. If we know it takes your AAC user a certain amount of time to start their communication, it can help to calculate this. Make sure everyone knows (eg. “Sally can take 4 seconds to start her communication, make sure you allow her time!”). We must remember to give the AAC user longer to respond before jumping in with prompts or taking over their turn to talk. Naturally, we often provide prompts and clues to our AAC users to help them use their AAC system to communicate with us. •	Physical prompts such as hand-over-hand prompting, when we take the AAC user’s hand and help them to point to the word. Whilst it can seem tempting to grab an AAC user’s hand to make them say words on their AAC system, it is better to avoid this. It has been shown that modeling is more effective than hand-over-hand prompting for learning and generalizing skills effectively. The final thing to remember about prompting is that we should try to avoid providing too many prompts. Keep thinking of ways to fade these prompts over time. Remember, regardless of how often we provide prompts or what type of prompts we provide, providing a model is still the most important thing we can do. And when allowing time and providing prompts gets no response from the AAC user, just provide a full model of the possible words suitable in the conversation. How we respond to an AAC user's attempts at communication is also really important. Responding to all communication attempts encourages interaction and the natural flow of conversation. It also gives us more chances to model and more opportunities to build and extend language. •	Acknowledge: we acknowledge all attempts at communication. •	Attribute meaning: We treat the AAC user’s communication as meaningful even if we don’t immediately understand how it’s relevant or they use a word for something that’s not currently available. Avoid assuming that communication we don’t understand is an accident. •	Expand: we expand the AAC user’s message. For example, if the AAC user says “more”, you can model back “want more” on the AAC system. •	Recast: we restate the AAC user’s message, so they can see different ways of conveying messages. eg. If the AAC users says “My turn”, we could say “Oh! you are telling me you want a go”, while pointing to “YOU” and “GO” on the AAC system. Good communication partners accept that AAC users communicating multi-modally. This means that any AAC user probably communicates in many different ways, not just their AAC system. AAC users may use a combination of vocalizations, words, word approximations, pointing to pictures or photos or objects, sign language, natural gestures, body language, and facial expressions, as well as their AAC system. Often, AAC users will choose the fastest and most efficient means of communication available to them in the moment. Every method of communication has its place. Each one should be valued, respected and responded to. An AAC user may choose to use their AAC system in some situations, yet fall back on less formal communication methods at other times. They may say some words using their AAC system (e.g. “I want that”), while pointing to the desired object. They may point to a picture on their visual schedule (e.g. “library”), while using body language and pointing to the door, to indicate they are asking about when they are going to the library. Maybe they use their AAC system to say something when their communication partners doesn’t understand their gestures and vocalizations. There are so many combinations and solutions that can make communication successful. A child verbally attempts to say “more” and then points to the bottle of bubbles. They have clearly communicated that they want more bubbles. What do you do? B. Do you use it as an opportunity to model and expand their language? You pick up their AAC system and say “Oh! You are telling me that … you want more bubbles”, while pressing “want more bubbles” on the AAC system. Or even model more language in a comment like “Bubbles are such fun”, or “Let’s blow them up high”, or “Get ready to get the bubbles!”. Of course, choice B is the best choice! Use every attempt at communication as a chance to socially engage and to model language. And respect every mode of communication. It all plays a part in becoming an effective communicator. Make small but powerful steps toward being a better communication partner, by thinking about how you model, prompt, respond and allow for multi-modal communication. This article on communication partner skills is just one in the Learn AAC series about “Starting Communication". Dos and Donts article on allowing Multi-modal communication. Important blog post on the prompting hierarchy. Talking about Talking, Carole Zangari. 5 Things Not to Say to AAC Learners, Carole Zangari. YouTube video on Non-directive language from Maureen Nevers and the Angelman Syndrome Foundation Communication Training Series. Blog post on attributing meaning to communication, Kate Ahern. Biederman, G.B., Fairhall, J.L., Raven, V.A., and Davey, V.A. (1998). Verbal Prompting, Hand-over-Hand Instruction, and Passive Observation in Teaching Children with Developmental Disabilities. Exceptional Children, 64:4, 503-511. Kent-Walsh, J., Murza, K.A.,Malani, M.D., and Binger, C. (2015). Effects of Communication Partner Instruction on the Communication of Individuals using AAC: A Meta-Analysis, Augmentative and Alternative Communication, 31:4, 271-284. A common misconception in AAC is that it will stop someone from learning to speak. Research shows that AAC can have positive effects on speech and language development, and does not stop an AAC user from learning to speak.